Oxis(formoterol) is a beta 2-agonist that has a fast-acting, long-lasting bronchodilatory effect. 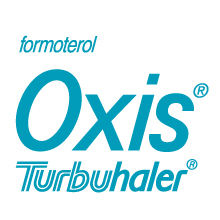 Oxis is delivered using the inhaler Turbuhaler. Oxis is a component of the inhaled steroid/beta 2-agonist combination inhaler Symbicort. The inhaled steroid component of Symbicort is Pulmicort(budesonide).